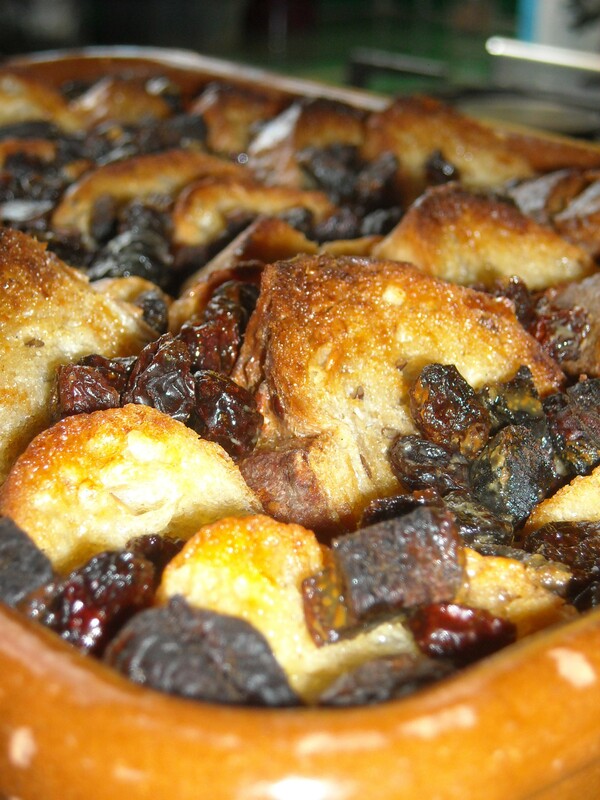 I have learned a delicious recipe here in France for Bread and Butter Pudding and though I do not know the exact quantities for the ingredients, it is easy to figure out. Spread butter thinly over all of the slices of bread and then stack them in an oven dish. Mix the rest of the ingredients in a bowl and then pour over bread. The mixture should cover three-fourths of the bread (if it doesn’t add more milk until so), and add dried fruits. Let it soak up the mixture for a couple of hours until the bread is soggy. Bake on 350 for about thirty minutes or until light brown on top. It is truly wonderful! I made another one tonight and used raisins and dried apricots and sprinkled it with cinnamon. Perhaps my first comment on this came through, I just know that it disappeared it seemed before I pushed the comment button. Looks scrumptous!! I don’t often care for raisins, except dry, but they even look good there. You’ll have to come spend a few days & be our cook. You can be a little more than that like the maid that cleans, etc. Well, you are getting a lot of experience doing that. Just teasing, you know, we want you as our granddaughter. Of course we know you won’t have a lot of over-night time as you will be looking for a job, but not on weekends. Naturally your parents will want you for most of them for a while. Anxious to see pictures with commentary. Love reading all you write.